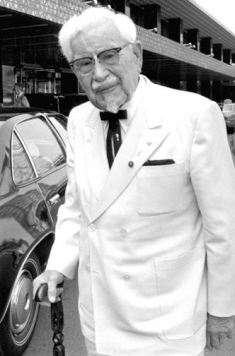 AKA Harland David Sanders, Sr.
Margaret Sanders, the eldest daughter of the late Harland Sanders, says in her new book that the KFC founder had a mistress, and even persuaded his wife to hire the woman to "help with the housework." "It was evident from the beginning that her presence would create turmoil," Margaret Sanders writes. "Mother refused to accept that she alone could not satisfy Father's physical needs, which from the very beginning of their marriage had seemed excessive to her." Later, she writes, the Colonel divorced his wife and married the mistress -- and then took both women to a presidential inauguration in Washington. Son: Harland David Sanders, Jr.